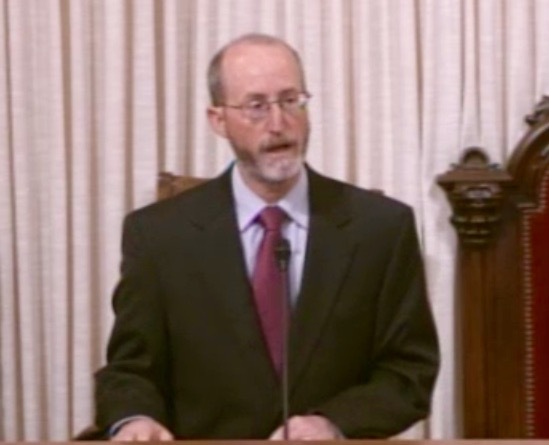 his swearing-in Thursday morning in Sacramento. STATE SENATE | 7TH DISTRICT | Steve Glazer’s new colleagues in the State Senate–especially those backed by labor–did not turn their backs or throw tomatoes as he was sworn-in Thursday morning by Gov. Jerry Brown. In fact, Glazer’s first vote (an aye vote), a procedural bill involving the state budget, was followed by a hearty round of celebratory hoots and hollering from lawmakers. Glazer’s special election victory in the Seventh District last week over another Democrat Susan Bonilla was highlighted by acrimony from labor unions who strongly opposed the new senator’s stance on transportation strikes. Although, Big Labor, still smarting from the bruising defeat, continued their rhetorical assault on Glazer even after Election Day, none of that ill-will was evident Tuesday on the senate floor. Even though Glazer’s tenure in the State Senate begins today, he won’t have much time before pivoting towards another potentially hard-fought re-election campaign in 2016. That’s because the May 19 special election was called to only fill out the remainder of Mark DeSaulnier’s term following his election last November to Congress. Posted in 2016 Election, Jerry Brown, Mark DeSaulnier, Orinda, SD7, State Senate, Steve Glazer, Susan Bonilla, swearing-in. Bookmark the permalink. Glazer is a buffoon. Just like all the other political phonies and losers they are beholding to. Hooray for another elected dope. Good deal, Senator Steve Glazer! He'll have a hard time holding on to that seat in 2016. Well the Corporate shill won and the consumer and middle class lost. That will change in Nov. 2016. Just saw an awesome bumper sticker on the 580. This is awesome; now I just need to find out where to get mine. Tag line–Senator Steve Glazer–for the next 13 years! Love the fact that Glazer just voted this week to give Medi-Cal benefits to undocumented immigrants. Outstanding! We all make mistakes, but he's a good guy anyway. He also failed to vote on a bill that would have raised the minimum wage to 13 dollars by 2017. He took a walk-the cowards way out. Not a good guy in my book! Glazer is a coward and a buffoon! Just like all the other political phonies and losers that are beholden to the corporations. Hooray for another elected dope that wants to screw the middle and lower class. You get what you pay for, and the corporate elite definitely paid for Glazer. Revenge is sweet. Wait for 2016 when he should be defeated. I'm sure there will be many more votes, or not voting that will piss people off. Glazer and Baker will be gone after 2016—–Good riddance! According to a Pew Research Center poll released Thursday, 72% of Americans support allowing immigrants living in this country illegally to stay and be granted legal status.